This is a collection of the best crowdfunding WordPress themes. Crowdfunding (or crowd financing, equity crowdfunding, or crowd-sourced fund raising) has become very popular as a method of raising money through the internet. The huge reach of the web allows individuals and organizations to use crowdfunding to raise funds for all types of projects, activities and causes. If you want to create your own niche crowdfunding community website similar to the likes of Kickstater, Indiegogo or Crowdfunder, the themes below are a great solution. Or if you simply need to build a small website for a single crowdfunding project you’d like to raise money for there are also suitable themes. Below are 10+ excellent crowdfunding WordPress themes that will help you build a professional crowd funding website quickly, easily and cheaply. Stellar is a bold, modern and professional crowdfunding WordPress theme that’s powered by the excellent IgnitionDeck Crowdfunding and Commerce plugins. The premium theme has been designed for serious individuals, non-profit organizations, and businesses that aim to develop a large-scale self hosted crowdfunding or fundraising platform website. Some of the key features of the Stellar theme include: custom content widgets to build your own homepage, crowdfunding project grid display on the homepage, mobile responsive, call to action widget, features widget, detailed project page, easy color customization, WooCommerce ready, slider plugin ready, plus all the other great features and functionality of the IgnitionDeck Crowdfunding platform. Fundify is an amazing crowd funding WordPress template that allows you to easily create your own crowd funding website with WordPress. It has a front end submission form that allows people to easily submit new campaigns. They can set the goal amount, the length of the campaign, and images and video can also be easily added to the campaign page. Once submitted, campaigns are set to “pending” for a site administrator to review and publish. Visitors can browse the site and “back” campaigns they are interested in supporting. Campaign “Backers” can pledge specified amounts of money towards a project and receive rewards for their contributions. The theme integrates with the PayPal Adaptive Payments extension to pre-approve a pledge amount, so the pledged amount will be charged and backers receive their reward only if a campaign reaches its goal in the time specified. Its supports 20+ payment gateways including PayPal, Stripe, Google Checkout, etc, and has a mobile responsive design. Backer is a premium WordPress theme that allows you to start your own crowdfunding / fundraising website. The Backer theme has a very clean, minimalist and professional design and integrates with the popular IngitionDeck plugin for the fundraising features and functionality. You can use the theme for all kinds of niches such as: charity, music, fashion, technology and anything else that you may think of. Some of the key features of the theme include: a modern and functional design focused on fundraising, fully responsive and retina ready (mobile friendly), custom project pages with a custom project sidebar, unique project grid layouts, unlimited crowd funding projects, revolution slider, front end submission, allows users to pledge on projects, custom project categories and search widgets, shortcodes, WPML support and ready for translation, minimalist blog layout and more. Theme 500 is a free crowdfunding WordPress theme that seamlessly integrates with the Ignition Deck WordPress crowd funding plugin. Ignition Deck is a powerful and featured packed WordPress Crowd funding platform that lets you to crowdfund, pre-sell or raise funds for projects. The 500 Framework theme has a clean white design (dark version also available) which you can use as is, or for a base to build on. It has a customizable homepage that lets you display any number of new projects. It includes Font Awesome, widget ready sidebars, custom menus and is 100% responsive. 500 Maximus is a premium crowd funding WordPress theme from IgnitionDeck designed for single project websites. 500 Maximus runs as a child theme for the 500 Framework – a WordPress crowdfunding framework that integrates seamlessly with the powerful Ingition Deck WordPress crowdfunding plugin. The theme has a clean, flat design, robust colour options and powerful selection of custom widgets designed for building an attractive website for a single project you wish to raise funds for. It’s fully responsive and will automatically adapt to work on any screen size and mobile device. You can find out about all the features / functionality and more information about the IgnitionDeck Crowdfunding platform here. 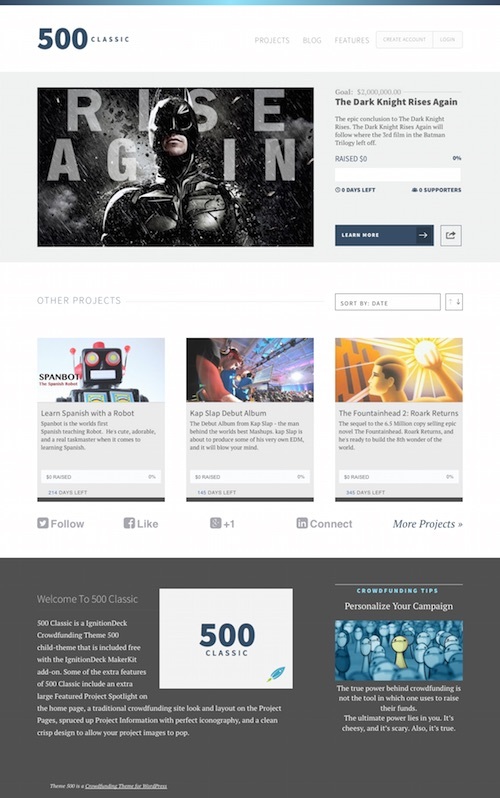 500 Classic is a child theme for the 500 Framework theme and uses the Ignition Deck WordPress crowd funding plugin. It features a large featured project on the homepage and a tried and true grid layout to display the other projects. Alternatively you could use the theme for a single project. 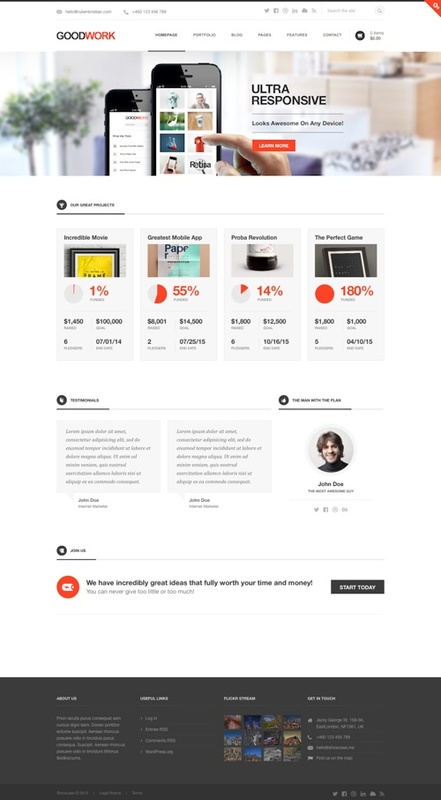 CrowdPress is an attractive and customizable crowd funding theme. The premium theme is powered by the free Easy Digital Downloads and Crowdfunding plugins. It has a big, bold design and is quite customisable. You can change the colours, styling and fonts and the Page customizer lets you change the layout, hideable items and other fun options. The mobile responsive layout ensures it will work on desktops, tablets and mobile phones. The FundingPress theme allows you to create your own crowd funding site quickly and easily. No third party plugins are needed with this theme and it utilizes PayPal Adaptive Payments. The site Admin can choose between collecting the funding themselves or enabling the user to do so. In the theme options the admin can set up the percentage of commission he wants to keep on each project, and payments are paid directly to each of the PayPal accounts. The theme uses custom front end forms for all the data, and it has a custom back-end admin panel with lots of options for customization. A Page Builder lets you create you project pages with drag and drop ease. It has unlimited color options and a mobile responsive design. Mission is a mega church WordPress theme with crowd funding functionality support. The theme is ideal for churches, non profit organizations or other groups that want to have a website that has inbuilt ecommerce functionality to sell things, and fund raising functionality to raise money for projects or whatever cause you want. The theme uses the WooCommerce plugin for ecommerce and IgnitionDeck for the crowd funding functionality. Some of the other features include: unlimited colours, lots of custom widgets, Google maps, events template, team page, a mobile responsive design and more. CrowdFunding is a theme for the Group Buying Site platform and is sold in their theme marketplace. 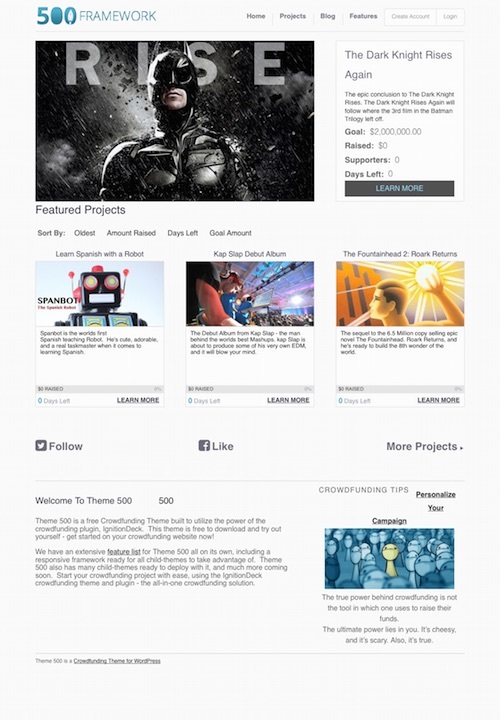 The theme lets users easily create and submit fundraising projects to the site where they can be reviewed by the admin. You can set funding goals and limits and also create multiple contribution levels. Customers are given their own account in which they can edit their profile information, view funded deals, earn referral credits, and view their invoices. It supports multiple payment gateways including PayPal, Payfast, Payment Express, Beanstream, Pagseguro, Bluepay, Moneris, Sagepay, and more. Briefly some of the other features include: location based features, customisation options, social and newsletter integration, sales management and reporting, sponsorship directory and more. It also has a mobile ready responsive design. 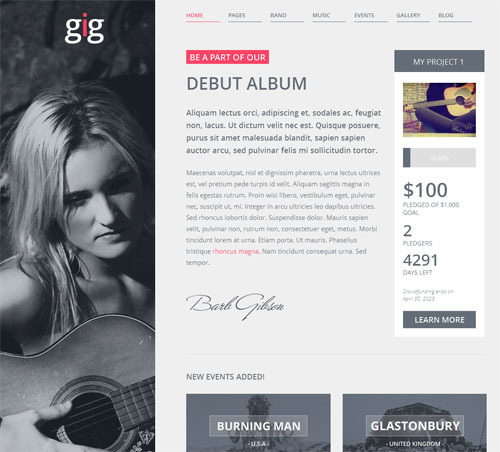 Gig is a premium music and band WordPress theme with support for crowd funding functionality. The theme has full support for the world’s most popular crowd funding plugin IgnitionDeck, so you can raise money for your projects. The crowd funding component is optional so you can use the theme for a music or band site or other projects. It is mobile ready with a responsive design and retina support. It has a color picker to change colors, custom post types for events, music, band members, and galleries, support for WordPress post formats, 5 different homepage templates, translation options and more. Startup Idea is a business and crowdfunding WordPress theme package designed to create a great looking website to promote a single crowdfunding campaign. The premium theme has a clean and contemporary design that will help you to inform the world about your startup business and showcase amazing product(s), concept, project or service. You can use it for a single product website, but its flexible enough to handle an entire catalogue of products if you wish. Some of the key features of the theme include: crowdfunding campaign ready for multiple projects, ability to split the fees for the project owner and for the crowdfunding platform, option for visitors to submit their campaigns and raise funding, integrated PayPal payment gateway, project management functionality, powerful custom admin dashboard, visual page composer, mobile friendly responsive design and more. Unity is a charity and crowdfunding WordPress theme ideal for non profit organizations and charities that are looking to raise money for various projects from their website. The theme is built with the flexible WPO framework and Bootstrap 3 and harnesses the power of the Easy Digital Downloads and Crowdfunding by Astoundify plugins for the functionality. Its compatible with WooCoommerce, is mobile friendly and has a heap of great features and options. Act is a multipurpose charity and non profit WordPress theme complete with a causes page and a crowdfunding system. The premium theme would be ideal for organizations that have various projects they are trying to raise money for. It has custom homepage with large header image and sections for donations and all the information you might need to present such as: who we are, stories, news and events, spotlight, projects, contact details and more. The theme is mobile friendly, has a crowdfunding system, donation option, events pages, WooCommerce ready, and lots of other features and options. 500 Venus is a WordPress theme designed to help you promote and take pre-orders for your product or project. The theme is built for makers and creators to showcase their product, tell your story in a professional and engaging manner and sell your pre-order products. It’s a child theme for 500 Framework and integrates directly with the IgnitionDeck WordPress plugins IgnitionDeck Crowdfunding and IgnitionDeck Commerce. 500 Venus has a highly customizable and modular home page, powerful widgets, pre-order button, and color options. GoodWork is a responsive multipurpose WordPress theme with an elegant and modern design. The premium theme supports the IgnitionDeck crowdfunding plugin as well as the WooCommerce ecommerce plugin allowing you to build an awesome portfolio, presentation site and crowdfunding website or online shop altogether. It offers two page templates for crowdfunding projects, six homepage options, visual composer page builder, portfolio templates, custom color and layout options, lots of other custom page templates, unlimited sidebars, typography options, HTML5 and CSS3 code, mobile friendly responsive design, and many more features. 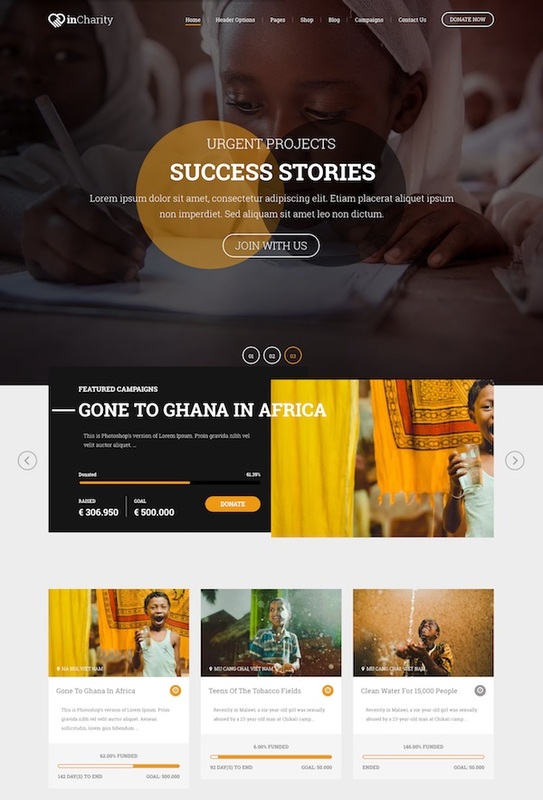 InCharity is a charity and fund raising WordPress theme for non profit organizations and others wanting to raise awareness about projects and activities and raise money. You can use the theme for single or multiple crowdfunding / fundraising campaigns. It has a modern, vibrant and professional design suitable for any charity, organization or religious institutions. It allows you to build as many campaigns as you want and comes with 2 campaign listing layout options. You can create single campaigns or give donors a reward as an incentive. It also comes with a heap of other nice features such as: 6 unique homepage layouts, visual composer page builder, featured campaigns, projects by region, WooCommerce support, and lots more.